..... Click the link for more information. near Geneva, Switzerland; in Russia important installations exist at Dubna and Serpukhov. ..... Click the link for more information. production by high-current proton beams, operate at conventional energies but produce much more intense beams than previous accelerators; this makes it possible to repeat early experiments much more accurately. In linear accelerators the particle path is a straight line; in other machines, of which the cyclotron is the prototype, a magnetic field is used to bend the particles in a circular or spiral path. 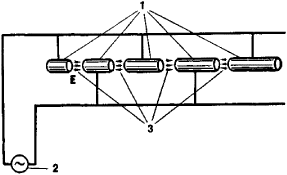 The early linear accelerators used high voltage to produce high-energy particles; a large static electric charge was built up, which produced an electric field along the length of an evacuated tube, and the particles acquired energy as they moved through the electric field. 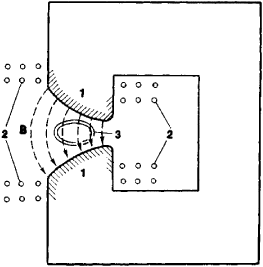 The Cockcroft-Walton accelerator produced high voltage by charging a bank of capacitors in parallel and then connecting them in series, thereby adding up their separate voltages. The Van de Graaff accelerator achieved high voltage by using a continuously recharged moving belt to deliver charge to a high-voltage terminal consisting of a hollow metal sphere. Today these two electrostatic machines are used in low-energy studies of nuclear structure and in the injection of particles into larger, more powerful machines. Linear accelerators can be used to produce higher energies, but this requires increasing their length. abbr. eV, unit of energy used in atomic and nuclear physics; 1 electron-volt is the energy transferred in moving a unit charge, positive or negative and equal to that charge on the electron, through a potential difference of 1 volt. ..... Click the link for more information. (eV)—electrons. SLAC is now used, however, not for particle physics but to produce a powerful X-ray laser. Modern linear machines differ from earlier electrostatic machines in that they use electric fields alternating at radio frequencies to accelerate the particles, instead of using high voltage. The acceleration tube has segments that are charged alternately positive and negative. 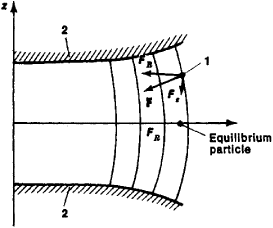 When a group of particles passes through the tube, it is repelled by the segment it has left and is attracted by the segment it is approaching. Thus the final energy is attained by a series of pushes and pulls. Recently, linear accelerators have been used to accelerate heavy ions such as carbon, neon, and nitrogen. In order to reach high energy without the prohibitively long paths required of linear accelerators, E. O. Lawrence proposed (1932) that particles could be accelerated to high energies in a small space by making them travel in a circular or nearly circular path. 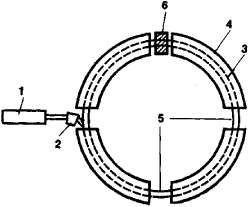 In the cyclotron, which he invented, a cylindrical magnet bends the particle trajectories into a circular path whose radius depends on the mass of the particles, their velocity, and the strength of the magnetic field. 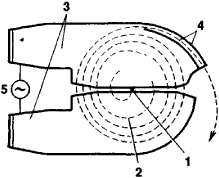 The particles are accelerated within a hollow, circular, metal box that is split in half to form two sections, each in the shape of the capital letter D. A radio-frequency electric field is impressed across the gap between the D's so that every time a particle crosses the gap, the polarity of the D's is reversed and the particle gets an accelerating "kick." The key to the simplicity of the cyclotron is that the period of revolution of a particle remains the same as the radius of the path increases because of the increase in velocity. Thus, the alternating electric field stays in step with the particles as they spiral outward from the center of the cyclotron to its circumference. However, according to the theory of relativity the mass of a particle increases as its velocity approaches the speed of light; hence, very energetic, high-velocity particles will have greater mass and thus less acceleration, with the result that they will not remain in step with the field. For protons, the maximum energy attainable with an ordinary cyclotron is about 10 million electron-volts. The 500-GeV synchrotron at the Fermi National Accelerator Laboratory at Batavia, Ill., was built to be the most powerful accelerator in the world in the early 1970s, with a ring circumference of approximately 4 mi (6 km). The machine was upgraded (1983) to accelerate protons and counterpropagating antiprotons to such enormous speeds that the ensuing impacts delivered energies of up to 2 trillion electron-volts (TeV)—hence the ring was been dubbed the Tevatron. The Tevatron was an example of a so-called colliding-beams machine, which is really a double accelerator that causes two separate beams to collide, either head-on or at a grazing angle. Because of relativistic effects, producing the same reactions with a conventional accelerator would require a single beam hitting a stationary target with much more than twice the energy of either of the colliding beams. ..... Click the link for more information. ) was intended to produce 40 TeV particle collisions. The program was ended in 1993, however, when government funding was stopped. ..... Click the link for more information. ). In 2012 CERN scientists announced the discovery of a new elementary particle consistent with a Higgs particle; they confirmed its discovery the following year. An electrical device which accelerates charged atomic or subatomic particles to high energies. The particles may be charged either positively or negatively. If subatomic, the particles are usually electrons or protons and, if atomic, they are charged ions of various elements and their isotopes throughout the entire periodic table of the elements. Particle accelerators fall into two general classes—electrostatic accelerators that provide a steady dc potential, and varieties of accelerators that employ various combinations of time-varying electric and magnetic fields. Electrostatic accelerators in the simplest form accelerate the charged particle either from the source of high voltage to ground potential or from ground potential to the source of high voltage. All particle accelerations are carried out inside an evacuated tube so that the accelerated particles do not collide with air molecules or atoms and may follow trajectories characterized specifically by the electric fields utilized for the acceleration. The maximum energy available from this kind of accelerator is limited by the ability of the evacuated tube to withstand some maximum high voltage. In contrast to the high-voltage-type accelerator which accelerates particles in a continuous stream through a continuously maintained increasing potential, the time-varying accelerators must necessarily accelerate particles in small discrete groups or bunches. An accelerator that varies only in electric field and does not use any magnetic guide or turning field is customarily referred to as a linear accelerator or linac. In the simplest version of this kind of accelerator, the electrodes that are used to attract and accelerate the particles are connected to a radio-frequency (rf) power supply or oscillator so that alternate electrodes are of opposite polarity. In this way, each successive gap between adjacent electrodes is alternately accelerating and decelerating. If these acceleration gaps are appropriately spaced to accommodate the increasing velocity of the accelerated particle, the frequency can be adjusted so that the particle bunches are always experiencing an accelerating electric field as they cross each successive gap. In this way, modest voltages can be used to accelerate bunches of particles indefinitely, limited only by the physical length of the accelerator construction. 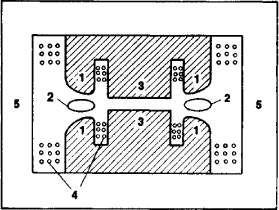 All conventional (but not superconducting) research linacs usually are operated in a pulsed mode because of the extremely high rf power necessary for their operation. The pulsed operation can then be adjusted so that the duty cycle or amount of time actually on at full power averages to a value that is reasonable in cost and practical for cooling. This necessarily limited duty cycle in turn limits the kinds of research that are possible with linacs; however, they are extremely useful (and universally used) as pulsed high-current injectors for all electron and proton synchrotron ring accelerators. Superconducting linear accelerators have been constructed that are used to accelerate electrons and also to boost the energy of heavy ions injected from electrostatic machines. These linacs can easily operate in the continuous-wave (cw) rather than pulsed mode, because the rf power losses are only a few watts. As accelerators are carried to higher energy, a linac eventually reaches some practical construction limit because of length. This problem of extreme length can be circumvented conveniently by accelerating the particles in a circular path maintained by either static or time-varying magnetic fields. Accelerators utilizing steady magnetic fields as guide paths are usually referred to as cyclotrons or synchrocyclotrons, and are arranged to provide a steady magnetic field over relatively large areas that allow the particles to travel in an increasing spiral orbit of gradually increasing size as they increase in energy. Practical limitations of magnet construction and cost have kept the size of circular proton accelerators with static magnetic fields to the vicinity of 100 to 1000 MeV. For even higher energies, up to 400 GeV per nucleon in the largest conventional (not superconducting) proton synchrotron in operation, it is necessary to vary the magnetic field as well as the electric field in time. In this way the magnetic field can be of a minimal practical size, which is still quite extensive for a 980-GeV accelerator (6500 ft or 2000 m in diameter). This circular magnetic containment region, or “racetrack,” is injected with relatively low-energy particles that can coast around the magnetic ring when it is at minimum field strength. 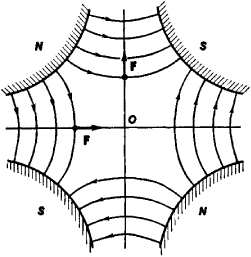 The magnetic field is then gradually increased to stay in step with the higher magnetic rigidity of the particles as they are gradually accelerated with a time-varying electric field. Beyond the limit just described, the only other possibility is to accelerate particles in opposite directions and arrange for them to collide at certain selected intersection regions around the accelerator. 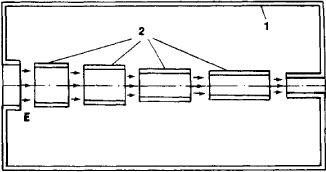 The main technical problem is to provide adequate numbers of particles in the two colliding beams so that the probability of a collision is moderately high. Such storage ring facilities are in operation for both electrons and protons. Besides storing the particles in circular orbits, the rings can operate initially as synchrotrons and accelerate lower-energy injected particles to much higher energies and then store them for interaction studies at the beam interaction points. Large proton synchrotrons have been used as storage-ring colliders by accelerating and storing protons in one direction around the ring while accelerating and storing antiprotons (negative charge) in the opposite direction. The proton and antiproton beams are carefully programmed to be in different orbits as they circulate in opposite directions and to collide only when their orbits cross at selected points around the ring where experiments are located. The antiprotons are produced by high-energy proton collisions with a target, collected, stored, cooled, and eventually injected back into the synchrotron as an antiproton beam. Although circular machines with varying magnetic fields have been developed because linacs of comparable performance would be too long (many miles), developments in linac design and utilization of powerful laser properties may result in a return to linacs that will outperform present ring machines at much lower cost. As a first example, the 20-GeV electron linac at Stanford University, Palo Alto, California, has been modified to provide simultaneous acceleration of positrons and electrons to energies as high as 50 GeV, while operating in what is called the SLED mode. 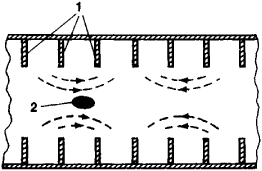 After acceleration the electrons and positrons are separated by a magnet, and the two beams are magnetically directed around the opposite sides of a circle so that they collide at one intersection point approximately along a diameter extending from the end of the linac across the circle. This collider arrangement is much less expensive than the 17-mi (27-km) ring at CERN and provides electron-positron collisions of comparable energies but at lower intensities. A device which accelerates electrically charged atomic or subatomic particles, such as electrons, protons, or ions, to high energies. Also known as accelerator; atom smasher. Prof Barlow said: "The exploitation of particle accelerators has expanded way beyond the confines of fundamental physics into many areas of science, technology, manufacturing and medicine. The machine is the first stage in the construction of a particle accelerator lab at the university. The musical talent at Particle Accelerator IV is scheduled to include White Rose Confession, ILYAIMY, Seed, the Barefoot Pianist, Kala Farnham, Morgan's Dreamworld, Billy Pilgrim, Restless Souls and many more. By 1954, a particle accelerator capable of accelerating protons to an energy of 5 to 6 billion electron volts (BeV) had been built at the University of California. The LHC is a particle accelerator at the CERN laboratory near Geneva, Switzerland, designed to answer fundamental questions, such as what gives elementary particles their mass, by colliding particles at higher energies than ever achieved in a laboratory before. Superfluid helium-4 has become a common tool of science and will be used as the coolant fluid in the Large Hadron Collider, a huge particle accelerator being built under the border between France and Switzerland. So first, the scientists had to create negatively charged antiprotons in a particle accelerator. London, June 21 (ANI): Tom Hanks has revealed he is such a space geek that he is willing to put his hand into a particle accelerator, also known as atom smasher. Space geek Tom Hanks says he can put his hand into moving particle accelerator! As members of the British Accelerator Science and Radiation Oncology Consortium (Basroc) we have proposed an entirely new kind of particle accelerator, unlike any that has ever been built. Radiation can be good for us! A new particle accelerator due to start operations next year at the European Organization for Nuclear Research (CERN) in Geneva should finally find the Higgs, physicists say. Suds throw wrench into accelerator Two empty beer bottles delayed the launch of the world's most powerful particle accelerator to probe the origins of the universe. A compact particle accelerator, known as a synchrotron, accelerates protons to variable energies into the beam transport line.